Also known as the “American Gentleman”, this dapper little pooch comes from a combination of the British Bulldog and a white English Bull Terrier. 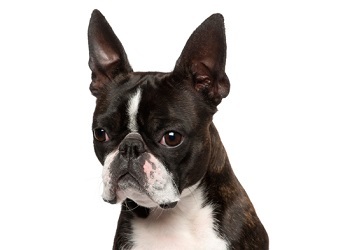 Despite their name, the Boston Terrier is not a true terrier. They were once known as the American Bull Terrier but their name was changed to reflect the city they were first bred in, Boston. The Boston Terrier is a polite dog who is friendly and loves to have fun. The Boston Terrier’s sparkling personality makes them great company and they love their human companions. They have a happy-go-lucky nature and are friendly, intelligent and eager to please. They are generally very well-mannered. They have moderate exercise needs, so a daily walk is sufficient. They are alert to strangers and despite their size are protective of their owners and so make a good watch dog. Basic training may take some patience as this dog needs constant, kind reinforcement and repetition. This is an easy-care breed that only needs a brush once a week and a regular bath. However, the Boston’s short compressed face means they need to be kept cool in the heat of summer, yet they don’t require constant air conditioning. Don’t smoke, use harsh chemicals and keep the Boston Terrier away from pollen and fresh-cut grass. Minimize activity in hot weather and walk on a harness which won’t constrict the throat. The folds of skin on the face need to be cleaned on a regular basis. Like all dogs, Boston Terriers require regular tick, flea, intestinal worms and heartworm treatments. Consult your veterinarian on treatment options. Desexing and vaccination against diseases, such as the deadly parvo virus and highly infectious canine cough, are also important to discuss with your vet. Border Collies need caring, active and patient owners who are willing to train and involve their Boston Terriers require a lot of time and attention and are happiest living indoors. They are also great with children and love to play. While quite active, Boston Terriers suit a small house or apartment with a gentle daily walk and a run in the back garden. These dogs do not cope well being left outside in winter for long periods.